The priceless tome was brought to an Alençon (Orne, Normandy) auctioneer specialising in the sale of religious objects, by an anonymous owner several months ago. It was discovered to have been a collection of texts written in the scriptorium of the Mont-Saint-Michel abbey, and includes Latin writing from Saint-Aubert, Bishop of Avranches, the founder of the Mont-Saint-Michel abbey; as well as poems, geographical notes, and music scores. The work had been due to be auctioned on May 5. As the first Mont manuscript to go on sale in 150 years, the opening price had been set at €50,000, and was expected to sell for many hundreds of thousands more. Yet, the auction has been threatened after the minister for culture prohibited the sale, saying that this text should belong to the State, in the same way as all other manuscripts known to have originated from the Mont’s scriptorium. But experts say it is not that simple, and a row has broken out over who has the rights to the work. According to experts, this particular manuscript differs from the others belonging to the State. They say it was not stamped during the French Revolution, and does not appear in the relevant inventories of 1801 or 1820. This, experts say, means that it does not belong to the public domain, and should be free to be sold at auction. Now, auctioneer Mr Biget is set to appeal the State’s decision before a Paris tribunal. Government representatives had not replied to requests for comment at the time of writing. 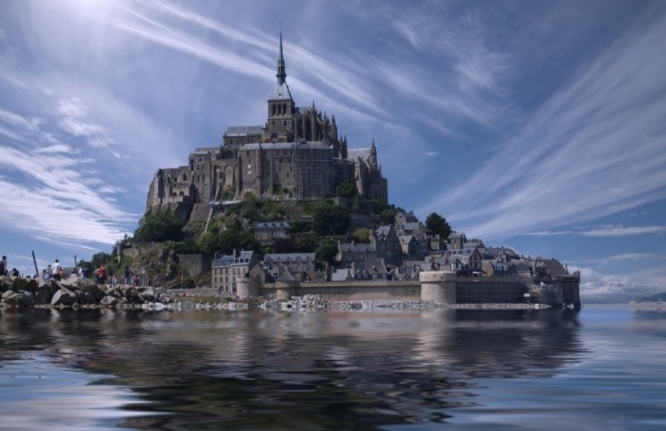 The Mont-Saint-Michel abbey or monastery forms part of the UNESCO World Heritage Site of the Normandy island commune of the same name. Originally completed in 1523, and a protected monument historique since 1862, the abbey now attracts millions of visitors a year, and is managed by government heritage body the Centre des monuments nationaux.